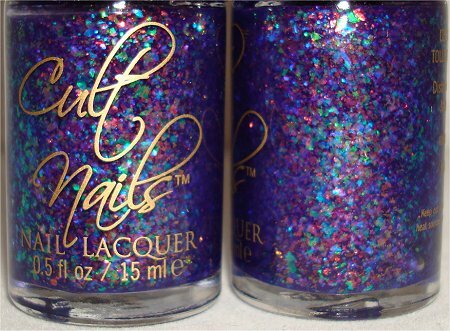 I’ve wanted a flaky polish ever since I stumbled upon a review of Unicorn Puke by Cult Nails (pictured below) unfortunately it also comes with about a $16 price tag if you can find it at all. It is a rainbow of flakies in a blue/purple base. Motley on the other hand contains a mixture of blue and green flakies in a clear base. I applied two thin coats of Motley over my pervious manicure (OPI’s Fly by Nicki Minaj). I found that Motley applied really well with great coverage in two coats, and dried relatively quickly. Motley works well as a layering polish, because it was made to be layered: Finger Paints sells a black polish alongside the special effects. I decided to pass on this option because I wanted to show the versatility of flakies over other polishes. This is the first flaky polish I’ve owned so I kinda failed to photograph the color changing/prism effect. I think that the last photo gives you a better idea, but this does not do the polish justice. I highly recommend this polish to anyone who wants a versatile layering flaky polish for a reasonable price.